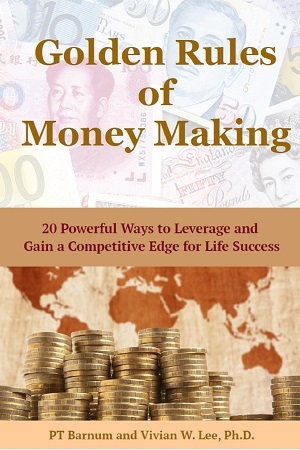 This is a newly revised book based on the original copy of "The Art of Money Making" or the "Golden Rules of Money Making" written by PT Barnum in 1880. After more than 136 years, this book is now completely revised and updated for modern day readers in the 21st century. Dr. Vivian W. Lee has added new Foreword, Introduction and Epilogue, guiding readers like you to learn some of the important life principles through some old stories and new insights. This book not only has the original text, but also includes new content with "20 Powerful Ways to Leverage and Gain a Competitive Edge for Life Success". After reading each of the original 20 chapters, you will find a new section on "Power to Leverage" at the end. This section will summarize, analyze and conclude with key points on life lessons and business tips. You will learn how to create your meaningful life path, in order to reach your fullest potential with lots of money making opportunities. -- achieve long-term SUCCESS with WHOM you choose to associate and build relationship. Download a digital copy now to create your time and money freedom!